The operator of a 5M Series cab will appreciate the reduction in noise and vibration through the seat, steering wheel, and lever controls with a rollover protective structure (ROPS) certified, factory-installed cab. The cabs are assembled to the tractor chassis as a complete unit and mounted on composite isolators. 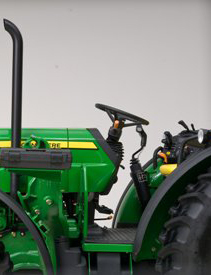 This system of assembly and mounting is similar to the successful mounting methods of the larger-horsepower tractors in the John Deere ag tractor family. The cab is very roomy, allowing ample space for controls and storage. And the flat floor adds to the spacious, open feel. The ceiling control panel is located on the upper right side and the AC components are located on the upper-rear corners of the cab, where visibility is not as critical. This provides the operator with visibility to the loader at a height unmatched by any competitor. 5M Series cabs provide a clean, quiet environment protected from the elements. Powerful air-conditioning and heating systems allow the operator to control the cab climate to preference, regardless of the conditions outside. The standard visor blocks the sun on bright days, while a dome light allows the operator to see controls at all times of the day. The cab's side windows open forward for excellent ventilation, and right- and left-side doors open wide for easy entry and egress. For excellent rear visibility, the fuel tank is located below the left-hand side of the platform. The rear window opens to 70 degrees, providing further visibility to the operator when hooking up implements. An interior rearview mirror provides additional visibility. 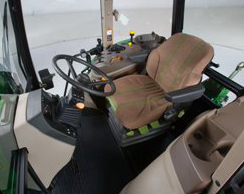 A tilt and telescoping steering column provides a custom fit for each operator. The clean, uncluttered interior design with flat platform maximizes operator space. And a conveniently located beverage holder provides space for the operator's drink of choice. Take further pleasure in the ride with a radio available as a field-installed attachment. Cabs are radio ready with speakers and a radio wiring harness. A Field Office™ (a removable briefcase) and an instructional seat can also be field installed for additional operating capabilities. 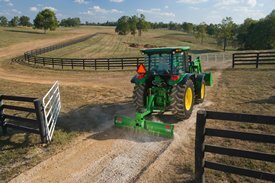 Excellent overall visibility in all applications with a swing-out rear window opens to a full 70 degrees for easier implement hookup and visibility. 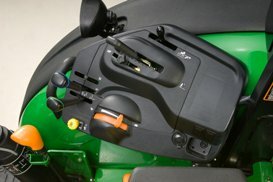 A front windshield wiper with washer ensures the operator can see the surroundings of the tractor (a rear wiper is available for field installation). Excellent night visibility is achieved with a full lighting package, and work lights are easily adjusted to redirect light without tools. There is a convenient three-pin power outlet for monitor, controllers, and other operating necessities. Four sets of mounting bosses and a removable rear access plug for monitor or controller harnesses also make using a monitor easy. A rear seven-pin electrical outlet socket for implement electrical requirements and a 90-amp alternator handles increased electrical requirements. To handle increased powertrain and hydraulic requirements in severe conditions, a hydraulic oil cooler is standard. The battery is located in the front of the tractor for easy access. Fenders are designed to provide plenty of tire clearance, even with the largest wheel-tire combinations. A deluxe adjustable cloth seat is standard with cab tractors. Ergonomically designed seat cushioning and support provide unsurpassed operator comfort. This is the same basic seat used with vinyl covering for the isolated open operator station tractors. Fore-aft adjustment is easy using a lever located at the operator's right-hand side. Height adjustment is accomplished without tools, and four possible positions set the limit for how high the seat will travel. Weight-suspension adjustment is easily accomplished from the seat, which adjusts to the operator's weight (100 lb to 275 lb; 45 kg to 125 kg). When the suspension is set to the weight of the operator, the indicated height setting appears through a display window. This allows the operator to set the seat suspension at its mid-point of travel. Armrests come standard with the seat and are adjustable. The backrest angle is adjustable with a lever in the lower-left corner of the seat cushion, and retractable seat belts are easily accessible. Operators can get even more comfortable with a field-installed backrest extension or lumbar and attenuation. Cab tractors can also be equipped with an optional air-suspension seat. The fully isolated design of the deluxe open operator station (DOOS) reduces vibration and noise, and keeps the operator comfortable throughout the workday. It also improves ride and visibility. Platform-mounted shift levers and suspended clutch and brake pedals contribute to a clean platform design and make it easier for the operator to get on and off the tractor. Debris deflectors, fender extensions, fender-mounted work lights, and floor mats are base equipment on the deluxe isolated open operator station. Controls are spaced out for clear and concise execution by the operator. 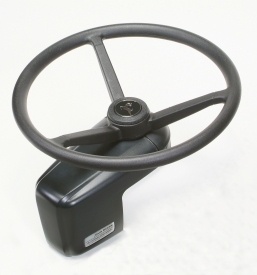 A conveniently placed, contoured throttle enables easy operator adjustments. A deluxe adjustable vinyl seat is standard on the isolated open operator stations. 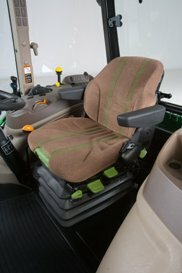 Ergonomically designed seat cushioning and support provide unsurpassed operator comfort; this is the same basic seat used in cab tractors (cloth covered). Making fore-aft adjustments is easy using a lever located to the operator's right. The height adjustment is accomplished without tools and four possible positions set the limit for how high the seat will travel. Weight/suspension adjustment is easily accomplished from the seat, which adjusts to the operator's weight (100 lb to 275 lb; 45 kg to 125 kg). When the suspension is set to the weight of the operator, the indicated height setting appears through a display window. This allows the operator to set the seat suspension at its mid-point of travel. Armrests come standard with the DOOS seat and are adjustable. The backrest angle is adjustable with a lever in the lower-left corner of the seat cushion, and retractable seat belts are easily accessible. 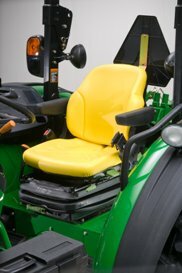 Operators can get even more comfortable with a field-installed backrest extension. Draft sensing allows the hitch to quickly raise or lower, as needed, to control the load on the engine. It also reduces the need to downshift into a lower gear when operating in a rough spot to eliminate a more complicated operating experience. The draft response is adjustable using the draft control lever to match the operating conditions and implement being used. The lower link draft sense utilizes the draft links to instantaneously sensor the load information coming from the implement and delivers it to the hitch control mechanism for fast, smooth, and accurate hitch corrections. The operator selects the rear hitch load setting by adjusting the draft-sense control knob. Depending on field conditions, it can be changed on the go. 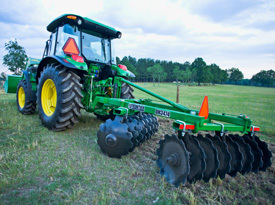 5M Series Tractors feature an open-center hydraulic system plumbed identically on each tractor. The 3-point hitch has priority over all the hydraulic control valves, so an operator can raise an implement at the end of a pass to turn, without having to turn the remote hydraulics off. The high-flow rate of the 5M Series, combined with the system's 2828-psi (195 bar) pressure, achieves excellent hydraulic performance and capacity. High loader breakout force is attained, so every drive into the feed pile results in a full bucket. Fast cycle times result in time saved when operators are moving material; operators won't have to waste time while the loader bucket dumps. The system supplies plenty of flow for running hydraulic motors, which is one more example of the versatility available with the 5M Series Tractors. All 5M tractors with a PowrReverser™ transmission come standard with a hydraulic oil cooler to handle increased power train and hydraulic requirements. The AutoTrac™ Universal (ATU) 200 steering kit is a machine steering kit used for automatic guidance in John Deere and non-John Deere machines. Pair the machine kit with a complete GreenStar™ system to operate automatic, hands-free guidance in approved machine platforms. AutoTrac offers many benefits to operators, including optimized machine efficiency, reduced operator fatigue, and the ability to work at faster speeds. The ATU 200 is the premier universal steering system in the agricultural industry. The PowrReverser transmission provides 16 forward speeds and 16 reverse speeds. This transmission comes standard with shiftable 540/540 Economy power take-off (PTO), and is ideal for operators using their tractors to perform in demanding applications and who require additional operating speed ranges. Unique knobs make it easy to distinguish between the two. The forward lever selects one of four speeds, all synchronized shifts for on-the-go shifting with the use of the clutch. The rear lever selects collar-shift A, B, C, and D.
Maximum productivity is achieved with hydraulic powershift between forward and reverse and is ideal for loader work and any applications that require frequent directional switches in tight spaces. Excellent modulation allows the operator to shift the direction lever from neutral to forward or reverse, forward to reverse, reverse to forward, or to neutral from forward or reverse. Operators can accomplish all these directional changes without sacrificing comfort or dealing with the hassle of depressing the clutch pedal. The speed of directional changes can be adjusted to the operator's preference or application demands with the field-installed infinitely variable control kit. An electrohydraulic fingertip directional lever control allows the operator to effortlessly switch directions with a small finger motion. The control is located on the left side of the instrument console and selects forward, reverse, and neutral positions. It also allows the operator to steer and shift direction with the left hand, freeing the right hand to operate other tractor controls, such as the loader, rear implements, or hand throttle. Constant-mesh helical-cut gears provide quieter operation and excellent reliability while the pressure-lubricated top shaft adds to the transmission durability. Fully enclosed, rigid shift linkages for short throw and crisp shifts enable all operators to clearly know what range and gear in which they are operating. Positive park pawl on the transmission provides positive park and eliminates the need for a hand brake. This also eliminates clutch service costs that occur when the park brake is accidentally left engaged. John Deere-designed and -manufactured diesel engines provide excellent torque, fuel efficiency, and durability. The high-pressure common rail (HPCR) and engine control unit (ECU) fuel system provides variable common-rail pressure, multiple injections, and higher injection pressures, up to 1600 bar (23,000 psi). It also controls fuel injection timing and provides precise control for the start, duration, and end of injection. The HPCR fuel system and ECU allow for multiple fuel injections. The number of fuel injections, based on speed and load, help contribute to lower combustion temperatures and lower noise levels. The electronic engine controls of the 4.5 PowerTech E engine monitor critical engine functions providing warning and/or shutdown to prevent costly engine repairs. Snapshot diagnostic data can be retrieved using commonly available diagnostic service tools. NOTE: The 5085M and 5095M Tier 3 models have a PowerTech M engine (mechanical fuel system). Turbocharged engines supply more air to the combustion chamber since the air is pre-compressed. The increased amount of air allows a corresponding increase in fuel injection which results in greater engine performance. Air-to-air aftercooling is the most efficient method of cooling intake air to help reduce engine emissions while maintaining low-speed torque, transient response time, and peak torque. Air-to-air aftercoolers allow engines to meet emissions regulations with better fuel economy. The heavy-duty cylinder block provides greater strength and rigidity, which is what allows these tractors to perform in ditches, ravines, and other less-than-ideal conditions. Statically- and dynamically-balanced crankshaft reduces engine vibration. The operator's body absorbs less vibration allowing them to stay attentive and consistent throughout the work day. High-ring piston design reduces the non-usable air in the combustion area of the cylinders for improved fuel efficiency and combustion so operators receive the most power from every engine stroke. Ni-resist inserts reduce ring groove wear, which would lead to less effective combustion, so operators have an engine that is proactive for performance. Tee-pee connecting rods provide increased strength and durability of both the connecting rod and the pistons, which allows operators to run in a wide array of conditions. Keystone-shaped top rings move slightly in the groove to clean the carbon deposits, conditioning the tractor to remain ready to work. Plasma-coated for reduced drag on cylinder wall and increasing overall tractor life. Engine oil cooler provides additional engine oil cooling, allowing operators to run in severe applications, reducing the likelihood that the engine will overheat. Cylinder liners dissipate heat to prevent cylinder distortion and rapid ring wear, allowing operators to see consistent performance. Certified John Deere technicians can easily restore engine to the original specifications after many hours of hard operation. This extends the years of performance. The wet-type cylinder liners are not available on the 5075M 5-cylinder engine. Full-pressure lubrication system ultimately protects your wallet from maintenance costs. The underside of each piston and piston pin is sprayed with cooled and filtered oil, which eliminates excessive heat for longer life. The full-flow filter allows the cleanest fuel to be delivered to the engine for maximum performance and filter bypass so the tractor will never be starved for oil due to an exhausted filter. A neutral start switch ensures operator and bystander safety, the right-hand gear shift lever must be in the park or neutral position for the engine to start. 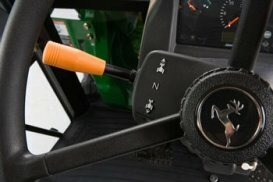 Electric fuel shutoff allows the operator to easily turn the tractor off with the key, just like an automobile. A solenoid on the injection pump permits using a key instead of a push-pull cable to shut off the engine. The electric fuel shutoff does not allow bypass starting. 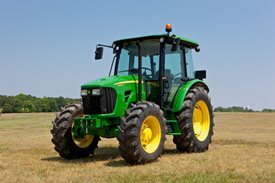 If an attempt is made to bypass start the tractor, through the use of electronics, the electric fuel shutoff will not allow the engine to start. A dry-type air cleaner has a dual-element design for added engine protection against dust or debris from entering the combustion chamber, ensuring performance time opposed to shop time. Reaching the filter for service is easy, the operator simply unlatches three clips. A restriction indicator light on the dash alerts the operator when servicing is required to save potential engine repairs. A single-element fuel filter partners up with the hand primer and water sediment bowl to deliver the complete package. John Deere designed specifically to meet the needs of John Deere tractors, the fuel filter provides a hand primer to prime the system for an easy fix for any operator who gets busy working and forgets to fuel up. The water separator stores water separated from the fuel to protect from the cost of replacing the fuel injection pump due to water contamination. The automotive-style fan drive belt drives the fan, water pump, and alternator. The belt features a self-adjusting spring tensioner, which eliminates service tasks, the need for a wrench, and extends the life of the belt because it is always in the correct adjustment. The use of biodiesel fuel up to 20% (B20) concentration is approved. Biodiesel fuel needs to meet ASTM PS 121 or DIN 51606 specifications. A local fuel supplier can provide specifications.